The Rev. Dr. John L. is a native of Shelton, Nebraska, the son of Rev. and Mrs. John Heins. 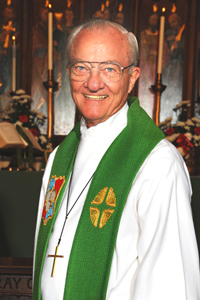 He attended St.John’s Academy and college, Winfield, Kansas, from 1947 to 1953 (AA Degree) and graduated from Concordia Seminary, St. Louis in 1958 (BA Degree). An honorary Doctor of Divinity Degree was awarded by St. Louis Seminary in December 1988. Graduate studies took place at Washington University in St. Louis. He vicarage was served at Zion Lutheran Church, Marengo, Illinois. Pastor Heins was ordained and installed into the Holy Ministry on July 20, 1958, at Faith Lutheran Church, Grand Blanc, Michigan. He served there from 1958 to 1974. In June of 1974, he was installed as Pastor of Guardian Lutheran Church, Dearborn, where he served until 1985 when he was elected President of the Michigan District. Pastor Heins has served the District in many capacities including President of the Michigan District from 1985-1997; First Vice President from 1978 to 1985; Fourth Vice President from 1977 to 1978; Secretary from 1975 to 1978; Convener of the District Youth Commission; and Vice Presidential representative to the Boards of Youth Ministry, Christian Education, and Stewardship. Pastor Heins has also served with distinction on a number of Synodical and community councils, boards and committees. With his wife Wilma, he has visited Missionaries in Nigeria, Hong Kong, Macao, Taiwan, and Red China. He and Wilma live in Saline, Michigan. They have four children.